To develop a mathematical model to estimate the relative differences in postoperative stromal tensile strength following photorefractive keratectomy (PRK), LASIK, and small incision lenticule extraction (SMILE). Using previously published data where in vitro corneal stromal tensile strength was determined as a function of depth, a mathematical model was built to calculate the relative remaining tensile strength by fitting the data with a fourth order polynomial function yielding a high correlation coefficient (R2 = 0.930). Calculating the area under this function provided a measure of total stromal tensile strength (TTS), based only on the residual stromal layer for PRK or LASIK and the residual stromal layers above and below the lenticule interface for SMILE. Postoperative TTS was greatest after SMILE, followed by PRK, then LASIK; for example, in a 550-μm cornea after 100-μm tissue removal, postoperative TTS was 75% for SMILE (130-μm cap), 68% for PRK, and 54% for LASIK (110-μm flap). The postoperative TTS decreased for thinner corneal pachymetry for all treatment types. In LASIK, the postoperative TTS decreased with increasing flap thickness by 0.22%/μm, but increased by 0.08%/μm for greater cap thickness in SMILE. The model predicted that SMILE lenticule thickness could be approximately 100 μm greater than the LASIK ablation depth and still have equivalent corneal strength (equivalent to approximately 7.75 diopters). This mathematical model predicts that the postoperative TTS is considerably higher after SMILE than both PRK and LASIK, as expected given that the strongest anterior lamellae remain intact. Consequently, SMILE should be able to correct higher levels of myopia. From London Vision Clinic, London, United Kingdom (DZR, TJA); the Department of Ophthalmology, Columbia University Medical Center, New York, New York (DZR); Centre Hospitalier National d’Ophtalmologie, Paris, France (DZR); and the Department of Ophthalmology, Emory University, Atlanta, Georgia (JBR). Dr. Reinstein is a consultant for Carl Zeiss Meditec (Jena, Germany), has a proprietary interest in the Artemis technology (ArcScan Inc, Morrison, Colorado), and is an author of patents related to VHF digital ultrasound administered by the Cornell Center for Technology Enterprise and Commercialization, Ithaca, New York. The remaining authors have no financial or proprietary interest in the materials presented herein. In small incision lenticule extraction (SMILE), the femtosecond laser creates two interfaces that define a refractive lenticule of stromal tissue (Video, available in the online version of this article). A dissector is passed through a small 2- to 3-mm incision to separate the lenticular interfaces and allow the lenticule to be removed in one piece, thus eliminating the need to create a flap.1,2 The absence of a flap and the fact that the stromal tissue is removed from within the stroma means that the anterior-most stromal lamellae remain intact after the procedure (except for the region of the small incision). This is in contrast to both LASIK, where the anterior stromal lamellae are severed by the creation of the flap and also by the excimer laser ablation, and surface ablation (photorefractive keratectomy [PRK]), where the anterior stromal lamellae are severed by the excimer laser ablation. In addition to cohesive tensile strength, tangential tensile strength (ie, stiffness along the stromal lamellae) and shear strength (ie, resistance to torsional forces) have both been found to vary with depth in the stroma. 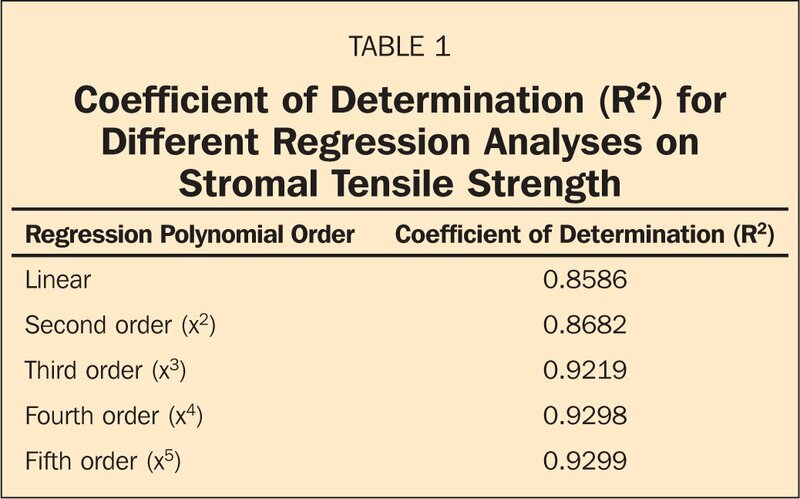 Kohlhaas et al.10 and Scarcelli et al.11 found that the tangential tensile strength was greater for anterior stroma than posterior stroma, each using a different methodology. There was a strong correlation between the results for cohesive tensile strength by Randleman et al.3 (Figure 1 ) and the results for tangential tensile strength by Scarcelli et al.11 (Figure 2 ). Petsche et al.12 found a similar result for transverse shear strength to decrease with stromal depth. Figure 1. Scatter plot of the percentage of maximum cohesive tensile strength against the percentage of residual stromal depth using data from the study by Randleman et al.3 Regression analysis found that a fourth order polynomial provided the closest fit to the data and the R2 of 0.93 demonstrated the high correlation achieved. Figure 2. Tangential tensile strength (longitudinal modulus of elasticity) measured by Brillouin microscopy at different depths in a (bovine) cornea including the epithelium (I), anterior stroma (II), posterior stroma (III), and the innermost region near the endothelium (IV). Reprinted with permission from Scarcelli G, Pineda R, Yun SH. Brillouin optical microscopy for corneal biomechanics. Invest Ophthalmol Vis Sci. 2012;53:185–190. The aim of the current study was to develop and use a mathematical model to estimate the relative differences in postoperative tensile strength of the cornea following LASIK, PRK, or SMILE. This study describes the derivation of a mathematical model that can be used to estimate the change in total tensile strength of the cornea after different corneal refractive surgical procedures. This model was then applied to compare the change in total tensile strength between SMILE, LASIK, and PRK. For the purposes of this model, it was assumed that the cohesive tensile strength data reported by Randleman et al.3 were representative of the overall biomechanical properties of the cornea, given the similar depth-dependent findings for cohesive tensile strength, tangential tensile strength, and transverse shear strength. For simplicity, we refer to tensile strength, although the underlying data were derived specifically for cohesive tensile strength. 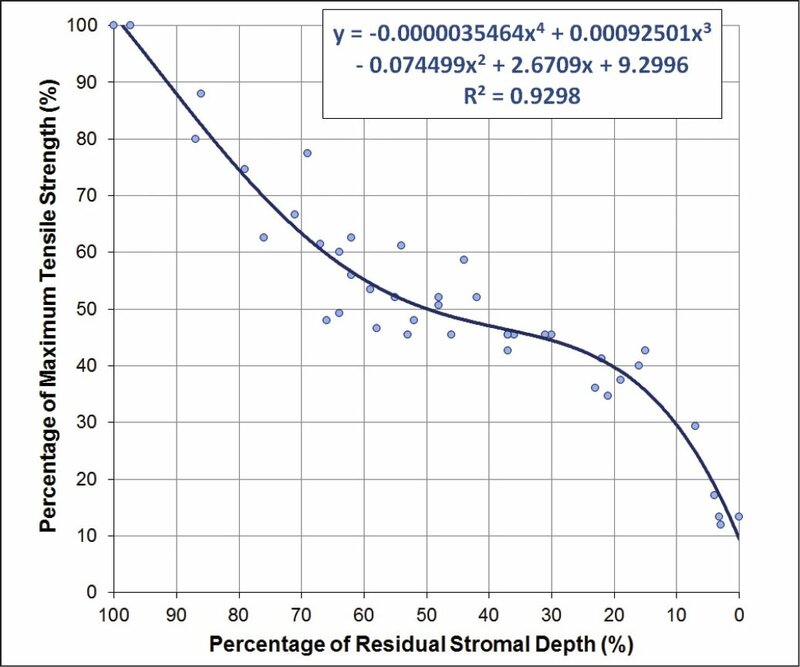 In the study by Randleman et al.,3 the results were presented as a graph showing the percentage of maximum tensile strength plotted against percentage of residual stromal bed depth, which has been reproduced in Figure 1 . We performed nonlinear regression analysis on this data to find the best-fit curve to approximate the average tensile strength across all stromal depths for this population. 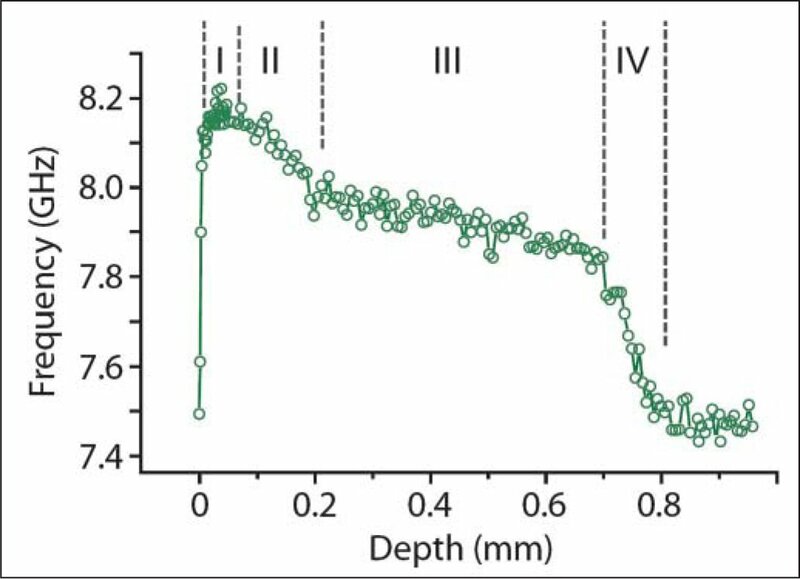 The total tensile strength of the untreated cornea was then calculated as the area under the regression line by integration. The total tensile strength of the cornea after LASIK was derived by calculating the area under the regression line for all depths below the residual stromal bed thickness (assuming the flap does not contribute to the tensile strength of the postoperative cornea).13 This value was divided by the total tensile strength of the untreated cornea to represent the relative total tensile strength as a percentage. Similarly, the total tensile strength of the cornea after PRK was derived by calculating the area under the regression line for all depths below the stromal thickness after ablation. Finally, the total tensile strength of the cornea after SMILE was calculated as the area under the regression line for all depths below the lower lenticule interface added to the area under the regression line for all depths above the upper lenticule interface or within the stromal cap. The three types of calculations are diagrammatically represented in Figure 3 . Figure 3. The fourth order polynomial regression equation was integrated to calculate the area under the curve for the relevant stromal depths after photorefractive keratectomy (PRK), LASIK, and small incision lenticule extraction (SMILE) as demonstrated by the green shaded regions. The red areas represent the tissue removed (excimer laser ablation/lenticule extraction) and the purple area in LASIK represents the LASIK flap. For preoperative central corneal thickness ranging from 450 to 650 μm with a fixed ablation depth/lenticule thickness of 100 μm (approximately −7.75 D), a LASIK flap thickness of 110 μm and a SMILE cap thickness of 130 μm. For flap/cap thickness ranging from 80 to 160 μm with a fixed ablation depth/lenticule thickness of 100 μm (approximately −7.75 D) and preoperative corneal thickness of 550 μm. For ablation depth/lenticule thickness ranging from 60 to 180 μm with a fixed preoperative central corneal thickness of 550 μm, a LASIK flap thickness of 110 μm, and a SMILE cap thickness of 130 μm. Microsoft Excel 2010 (Microsoft Corporation, Redmond, WA) was used for all of the data modeling and calculations. The depth-dependent stromal tensile strength data graph is reproduced in Figure 1 . Table 1 shows the R2 values for the regression analysis using a linear, quadratic, third, fourth, and fifth order fit. It can be seen that the best fit was achieved using a fourth order polynomial, with an R2 of 0.930 demonstrating the high correlation achieved by a non-linear fit, and no further improvement in the R2 with a fifth order polynomial. The fourth order regression line was integrated and this equation was used to calculate the area under the curve for the relevant stromal depths for PRK, LASIK, and SMILE. An online version of the model is available for download at www.londonvisionclinic.com/biomechanicsmodel. 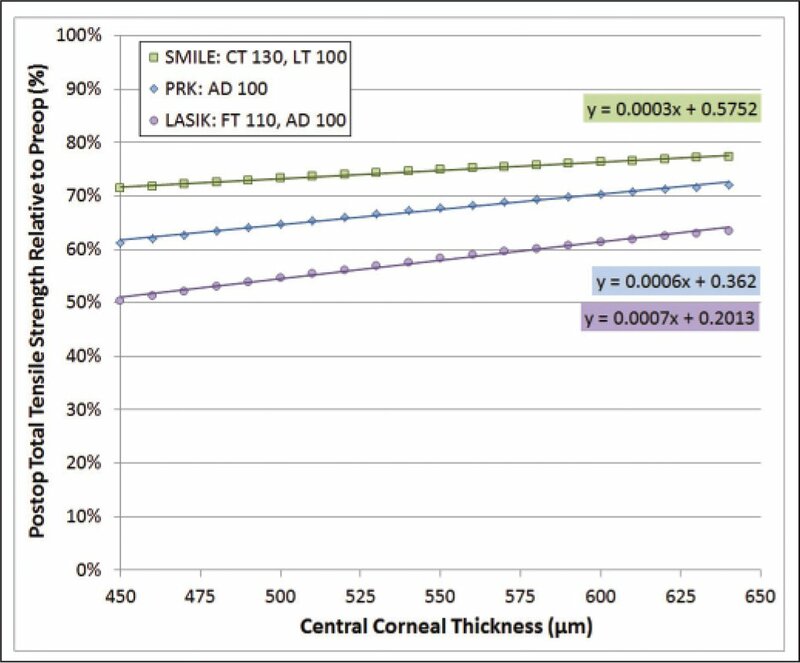 Figure 4 shows the relative total tensile strength after PRK, LASIK, and SMILE plotted against a range of central corneal thicknesses for a fixed ablation depth/lenticule thickness of 100 μm, a LASIK flap thickness of 110 μm, and a SMILE cap thickness of 130 μm. The postoperative relative total tensile strength was greatest after SMILE, followed by PRK, and was lowest after LASIK. For example, for a cornea with central corneal thickness of 550 μm, the postoperative relative total tensile strength was 75% for SMILE, 68% for PRK, and 54% for LASIK. The linear regression equations plotted for each procedure demonstrated that the postoperative relative total tensile strength decreased with corneal thickness by 0.07%/μm in LASIK, 0.06%/μm in PRK, and 0.03%/μm in SMILE. Figure 4. Scatter plot comparing total tensile strength for a fixed ablation with varying corneal thicknesses after LASIK (purple), photorefractive keratectomy (PRK) (blue), and small incision lenticule extraction (SMILE) (green) against a range of central corneal thickness for a fixed ablation depth/lenticule thickness of 100 μm (approximately −7.75 D), a LASIK flap thickness of 110 μm, and a SMILE cap thickness of 130 μm. The postoperative relative total tensile strength was greatest after SMILE, followed by PRK, and was lowest after LASIK. 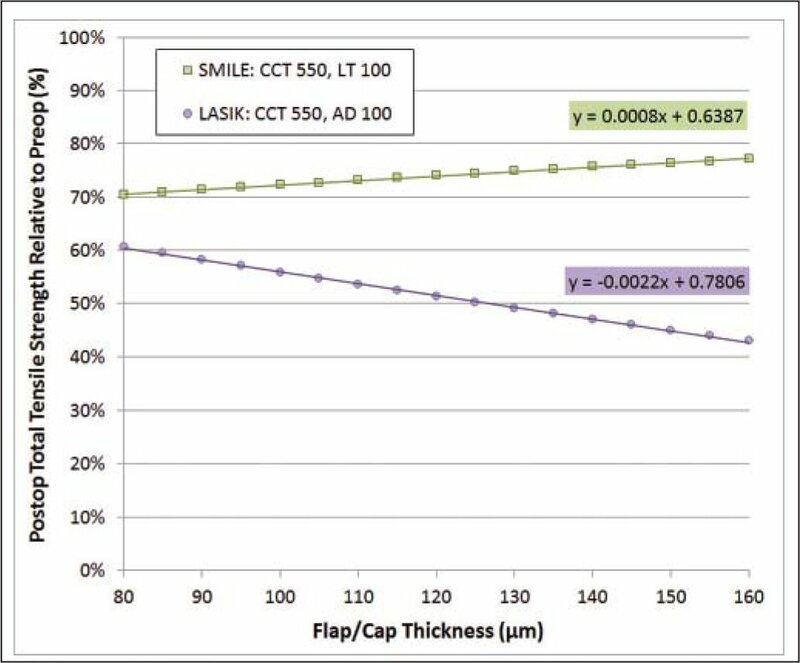 Figure 5 shows the relative total tensile strength after LASIK and SMILE plotted against a range of flap/cap thicknesses for a fixed central corneal thickness of 550 μm and ablation depth/lenticule thickness of 100 μm (approximately −7.75 D). In LASIK, the postoperative relative total tensile strength decreased for greater flap thickness by 0.22%/μm. On the contrary, the postoperative relative total tensile strength increased for greater cap thickness by 0.08%/μm for SMILE. Figure 5. Scatter plot of the relative total tensile strength after LASIK (purple) and small incision lenticule extraction (SMILE) (green) plotted against a range of flap/cap thicknesses for a fixed central corneal thickness of 550 μm and ablation depth/lenticule thickness of 100 μm (approximately −7.75 D). In LASIK, the postoperative relative total tensile strength decreased for greater flap thickness by 0.22%/μm. In SMILE, the postoperative relative total tensile strength increased for greater cap thickness by 0.08%/μm. 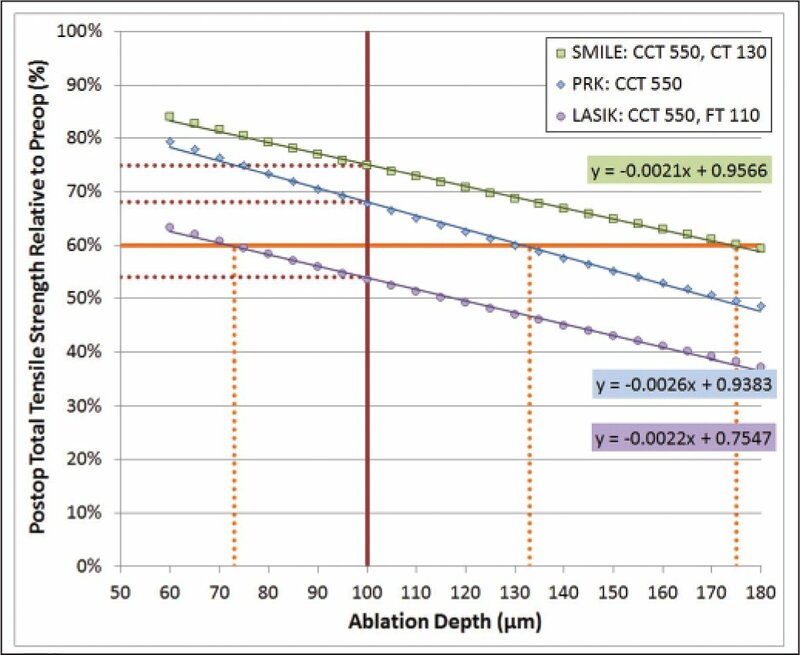 Figure 6 shows the relative total tensile strength after PRK, LASIK, and SMILE plotted against a range of ablation depths/lenticule thicknesses for a fixed central corneal thickness of 550 μm, a LASIK flap thickness of 110 μm, and a SMILE cap thickness of 130 μm. The postoperative relative total tensile strength reached 60% for an ablation depth of 73 μm in LASIK, 133 μm in PRK, and 175 μm in SMILE. This is equivalent to a −5.75 diopters (D) treatment with the MEL80 excimer laser (Carl Zeiss Meditec, Jena, Germany) standard ASA profile (73 μm), compared to a −13.50 D SMILE treatment (175 μm). Figure 6. This graph shows the relative total tensile strength after LASIK (purple), photorefractive keratectomy (PRK) (blue), and small incision lenticule extraction (SMILE) (green) plotted against a range of ablation depths for a fixed central corneal thickness of 550 μm, a LASIK flap thickness of 110 μm, and a SMILE cap thickness of 130 μm. The orange lines indicate that the postoperative relative total tensile strength reached 60% for an ablation depth of 73 μm in LASIK (approximately −5.75 diopters [D]), 132 μm in PRK (approximately −10.00 D), and 175 μm in SMILE (approximately −13.50 D), translating to a 7.75 D difference between LASIK and SMILE for a cornea of the same postoperative relative total tensile strength. The red lines indicate that the postoperative relative total tensile strength after a 100 μm tissue removal would be 54% in LASIK, 68% in PRK, and 75% in SMILE. Table 2 shows the relative total tensile strength after LASIK for a range of residual stromal bed thicknesses for a fixed central corneal thickness of 500 μm and a LASIK flap thickness of 110 μm. The relative total tensile strength is then also shown for PRK and SMILE with the equivalent tissue removal for each example of LASIK. A mathematical model based on depth-dependent stromal tensile strength data produced by Randleman et al.3 predicted that the postoperative relative total tensile strength of the cornea would be significantly greater after SMILE than both PRK and LASIK due to the fact that the strongest anterior lamellae remain intact. The model predicted that SMILE lenticule thickness (assuming a 130-μm cap) could be approximately 100 μm greater than the ablation depth in LASIK (assuming a 110-μm flap) and still have equivalent corneal strength. In terms of refractive error, this translates to correcting approximately 7.75 D more myopia treated (although this will depend on the type of ablation/lenticule profile and cap/flap thickness used) with SMILE than with LASIK for a cornea of the same postoperative relative total tensile strength. In terms of corneal tensile strength, this translates to an increase of approximately 21% for any given myopic treatment performed with SMILE than with LASIK. It is generally accepted that a certain uncut residual stromal thickness is required after ablation to minimize postoperative corneal ectasia risk in a normal (non-keratoconic) cornea. A residual stromal bed thickness of 250 μm is commonly used as the residual bed thickness necessary to prevent ectasia and it is generally accepted that the lower the residual stromal bed thickness, the higher the risk of developing postoperative ectasia. This model demonstrates how the opposite is true for SMILE: the thicker the cap (and therefore the deeper the lenticular tissue removal) and hence the lower the residual stromal bed thickness, the greater the residual tensile strength. This finding is logical from the knowledge that anterior stroma is stronger, and supports the notion that it should be possible to correct much higher levels of myopia by SMILE compared to LASIK or PRK. This also translates to SMILE resulting in greater retention of stromal tensile strength compared to any given LASIK or PRK procedure. Taking this concept to the theoretical extreme, removing the lenticule from the more posterior aspect of the cornea would maximize the postoperative relative total tensile strength and could increase the possible myopic correction even further. Practically speaking, there are unknowns relating to the accuracy (and endothelial safety) of femtosecond laser cutting deep in the stroma and issues relating to the biomechanics dictating relative back surface changes that may occur in the instance of deeper lenticular tissue removal. The model described in this study predicted that the difference in relative remaining total tensile strength between the three procedures would be slightly greater for thinner corneas than thicker corneas. This would make sense, because in LASIK flap stroma plus ablation within the stronger anterior stroma would comprise a greater percentage loss of total tensile strength than lenticular removal from relatively weaker stromal tissue deeper within the stroma while leaving stronger anterior stroma uncut. For a 450-μm cornea, there was a 21% difference in relative total tensile strength between SMILE and LASIK compared with a 14% difference for a 650-μm cornea. This demonstrates that the residual thickness based safety of corneal laser refractive surgery in general should not be thought of in terms of residual stromal bed thickness, but at least in terms of total residual uncut stroma. Ideally, a parameter such as total tensile strength, which takes the nonlinearity of the strength of the stroma into account, seems more appropriate. For example, the residual stromal bed thickness under the interface in SMILE could easily be less than 250 μm due to the additional strength provided by the untouched stromal lamellae in the cap, as long as the total remaining corneal tensile strength is comparable to that of the postoperative LASIK 250 μm residual stromal bed thickness standard. In this new case of using remaining total tensile strength, the minimum would evidently be defined as the total tensile strength remaining after LASIK with a residual stromal bed thickness of 250 μm. In this model, there are some factors that have not been considered. First, this model only considers the central point on the cornea. A full model of the cornea, for example by finite element analysis, that can take into account the stromal thickness progression and the volume of the ablation profile would be a significant improvement but is likely to provide the same data qualitatively, albeit perhaps more accurately in terms of absolute tensile strength changes. In our model, we have made the assumption that the stromal lamellae in the LASIK flap do not contribute to the total tensile strength of the cornea at all, an assumption that is supported by published studies demonstrating negligible contribution. Schmack et al.13 found that the mean tensile strength of the central and paracentral LASIK wounds was only 2.4% that measured in control eyes. Knox Cartwright et al.20 experimentally demonstrated a LASIK flap depth-dependent increase in corneal strain; they measured an increase in strain of 9% for a 110-μm flap and 33% for a 160-μm flap. This result is predicted by our current model, which showed that the remaining relative total tensile strength would be less for thicker flaps, as would be expected. Another factor not considered is that Bowman’s layer remains intact after SMILE, which is not true in either LASIK or PRK. Bowman’s layer has been shown to have different biomechanical properties than stromal tissue, as demonstrated by Seiler et al.,21 who showed that removing Bowman’s layer with an excimer laser reduced the Young’s modulus by 4.75%. Leaving Bowman’s layer intact may further increase the corneal biomechanical stability after SMILE compared with LASIK and PRK. The current model also does not consider the effect of the tunnel incision on tensile strength changes, which, although small, will not be zero. A mathematical model derived from depth-dependent stromal tensile strength data quantified the difference in postoperative relative total tensile strength between SMILE, PRK, and LASIK. The flap-less intrastromal SMILE procedure brings the advantage of leaving the strongest anterior stromal lamellae intact to maximize the strength of the cornea after the procedure compared with PRK and LASIK. This model demonstrates that SMILE does not follow the same criteria as LASIK for residual stromal bed thickness calculations and hence can be expected to correct higher levels of myopia within the cornea than is currently possible by LASIK or PRK. Sekundo W, Kunert KS, Blum M. Small incision corneal refractive surgery using the small incision lenticule extraction (SMILE) procedure for the correction of myopia and myopic astigmatism: results of a 6 month prospective study. Br J Ophthalmol. 2011;95:335–339 doi:10.1136/bjo.2009.174284 [CrossRef] . Shah R, Shah S, Sengupta S. Results of small incision lenticule extraction: all-in-one femtosecond laser refractive surgery. J Cataract Refract Surg. 2011;37:127–137 doi:10.1016/j.jcrs.2010.07.033 [CrossRef] . MacRae S, Rich L, Phillips D, Bedrossian R. Diurnal variation in vision after radial keratotomy. Am J Ophthalmol. 1989;107:262–267. Maloney RK. Effect of corneal hydration and intraocular pressure on keratometric power after experimental radial keratotomy. Ophthalmology. 1990;97:927–933. Müller LJ, Pels E, Vrensen GF. The specific architecture of the anterior stroma accounts for maintenance of corneal curvature. Br J Ophthalmol. 2001;85:437–443 doi:10.1136/bjo.85.4.437 [CrossRef] . Ousley PJ, Terry MA. Hydration effects on corneal topography. Arch Ophthalmol. 1996;114:181–185 doi:10.1001/archopht.1996.01100130175011 [CrossRef] . Simon G, Ren Q. Biomechanical behavior of the cornea and its response to radial keratotomy. J Refract Corneal Surg. 1994;10:343–351. Simon G, Small RH, Ren Q, Parel JM. Effect of corneal hydration on Goldmann applanation tonometry and corneal topography. Refract Corneal Surg. 1993;9:110–117. Kohlhaas M, Spoerl E, Schilde T, Unger G, Wittig C, Pillunat LE. Biomechanical evidence of the distribution of cross-links in corneas treated with riboflavin and ultraviolet A light. J Cataract Refract Surg. 2006;32:279–283 doi:10.1016/j.jcrs.2005.12.092 [CrossRef] . Scarcelli G, Pineda R, Yun SH. Brillouin optical microscopy for corneal biomechanics. Invest Ophthalmol Vis Sci. 2012;53:185–190 doi:10.1167/iovs.11-8281 [CrossRef] . Petsche SJ, Chernyak D, Martiz J, Levenston ME, Pinsky PM. Depth-dependent transverse shear properties of the human corneal stroma. Invest Ophthalmol Vis Sci. 2012;53:873–880 doi:10.1167/iovs.11-8611 [CrossRef] . Schmack I, Dawson DG, McCarey BE, Waring GO 3rd, Grossniklaus HE, Edelhauser HF. Cohesive tensile strength of human LASIK wounds with histologic, ultrastructural, and clinical correlations. J Refract Surg. 2005;21:433–445. Dawson DG, Grossniklaus HE, McCarey BE, Edelhauser HF. Biomechanical and wound healing characteristics of corneas after excimer laser keratorefractive surgery: is there a difference between advanced surface ablation and sub-Bowman’s keratomileusis?J Refract Surg. 2008;24:S90–S96. Roy AS, Dupps WJ Jr, . Patient-specific computational modeling of keratoconus progression and differential responses to collagen cross-linking. Invest Ophthalmol Vis Sci. 2011;52:9174–9187 doi:10.1167/iovs.11-7395 [CrossRef] . Patel S. Refractive index of the mammalian cornea and its influence during pachometry. Ophthalmic Physiol Opt. 1987;7:503–506 doi:10.1016/0275-5408(87)90085-8 [CrossRef] . Seiler T, Kriegerowski M, Schnoy N, Bende T. Ablation rate of human corneal epithelium and Bowman’s layer with the excimer laser (193 nm). Refract Corneal Surg. 1990;6:99–102. Huebscher HJ, Genth U, Seiler T. Determination of excimer laser ablation rate of the human cornea using in vivo Scheimpflug videography. Invest Ophthalmol Vis Sci. 1996;37:42–46. Knox Cartwright NE, Tyrer JR, Jaycock PD, Marshall J. Effects of Variation in depth and side cut angulations in LASIK and thinflap LASIK using a femtosecond laser: a biomechanical study. J Refract Surg. 2012;28:419–425 doi:10.3928/1081597X-20120518-07 [CrossRef] . Seiler T, Matallana M, Sendler S, Bende T. Does Bowman’s layer determine the biomechanical properties of the cornea?Refract Corneal Surg. 1992;8:139–142. This player is used for Journal content on Healio.com.